Where will we go and what kinds of things will we see and do? Where will we go and what kind of things will we see and do? Chosen on the day of tour as stated above, and no matter where we go you won't be disappointed. Many options are available, and a run down of what you're likely to be getting yourself into will take place when briefed, before and during the tour. There's lots out here- Sea Caves, Rock Gardens, Islands, idyllic bays and secluded coves, mellow to challenging conditions. Much of the area is under jurisdiction of the Department of Conservation, and some of the coast is destined to become a geological reserve, because of its uniqueness. The oldest rock formations in the North Island going back 251 million years, make up an island (Arrow Rocks) just 500m off shore of our headquarters. Aside from the areas unique beauty, it is also historically significant, with early Maori and European settlement. 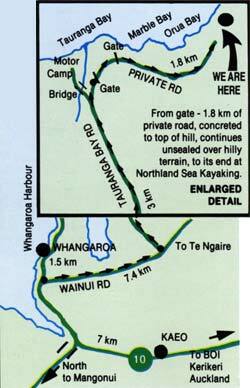 The coast is dotted with Maori 'Pa' sites (fortifications), and also the remains of early whaling stations. The impact of the two cultures is widely evident, and imparts a rich awareness of the regions past and present. kayaks, paddles, spray skirts, seat padding (much appreciated), instructions, guidance and fun! Part of the adventure is getting here, and it's worth it! Please take care to close all gates behind you.